It's the first day of summer, so we kick it off with a love letter to the game that's all about it. A fictional recollection of a boyhood summer vacation in Japan. Is there any season of the year more desirable to young people than summer, particularly the summer break? The opportunity to escape authority and forget everything you’ve learned in school, to make new friends or get to know your current ones better. It’s a short but sweet period of freedom that lasts for only a couple decades of life, one that adults still long for. For being such a fabled time of the year, summer has also had its share of the pop culture spotlight. Authors write flowing prose about the virtues of summer and novels about disenchanted teens finding themselves after school lets out. Filmmakers paint pictures of the American road trip, with wars being mounted in the backseat. Yet video games, for whatever reason have not embraced the season as much. 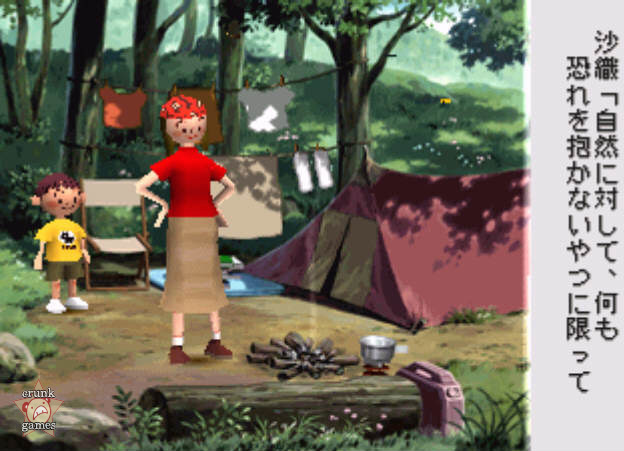 Love adventures have had their share of awkward summer romance, but nothing to really capture the mass market with. But at the turn of the millennium, Sony released a game for the original PlayStation that would attempt to faithfully recreate the mystique of a summer vacation, mainly for adults who had lost their childhood. Set in August of 1975, Boku no Natsuyasumi (Bokunatsu for short) is the story of a nine year-old boy named Boku. His name, as you might deduce, is a pun. 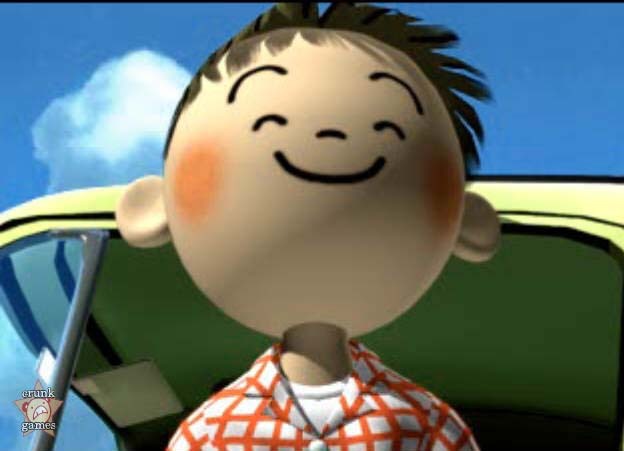 Since "boku" in Japanese is a male form of "I" or "me", his introductions can be a bit humorous ("boku wa Boku!"). 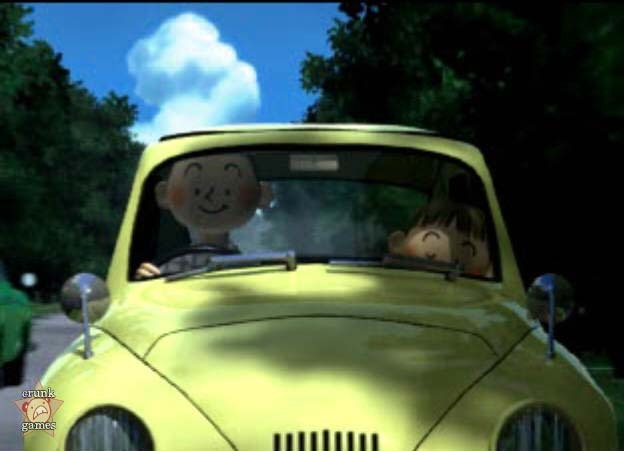 With Boku’s mother just about to give birth to her second child, the parental units send him away to his aunt and uncle’s house far off in the countryside, to spend the next 31 days (with emphasis on education, vacation for kids typically lasts for the final summer month). After meeting his aunt, uncle and female cousins, Boku gets settled in for his summer vacation, and by the next morning, the journey begins. 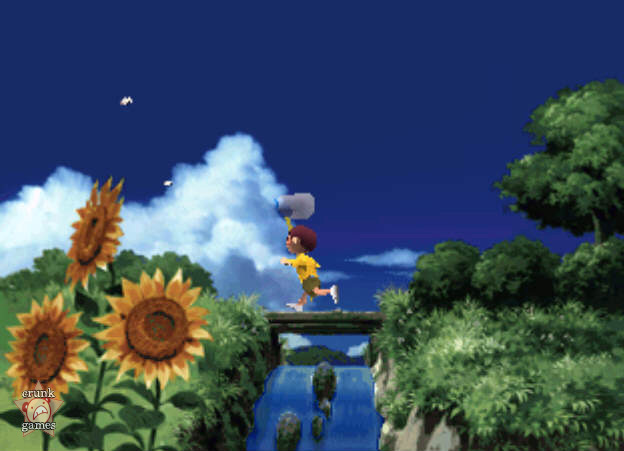 At the start of the game, players have a limited area to run around in, but as the days go on, paths to new areas can be cleared, like when Boku stumbles upon the tiny beach hidden at the end of the woods, or comes upon the vast sunflower field at twilight. It doesn’t get much more rewarding than that. Earlier on, Boku meets a group of boys about his age who have a makeshift clubhouse underneath the freeway overpass. There’s the stoic Guts, chubby funnyman Fat, and the nerdy but trusty Megane. It’s there that Boku can do a little male bonding for when the family gets to be too much, and best of all, engage in a little beetle sumo wrestling. 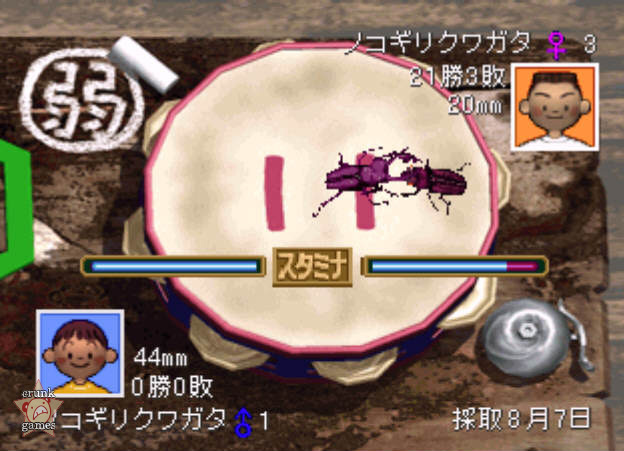 Yes indeed — amongst the fishing, kite flying and insect collecting, players can amass an army of beetles of various sizes and get them into the ring, or rather, onto the tambourine. 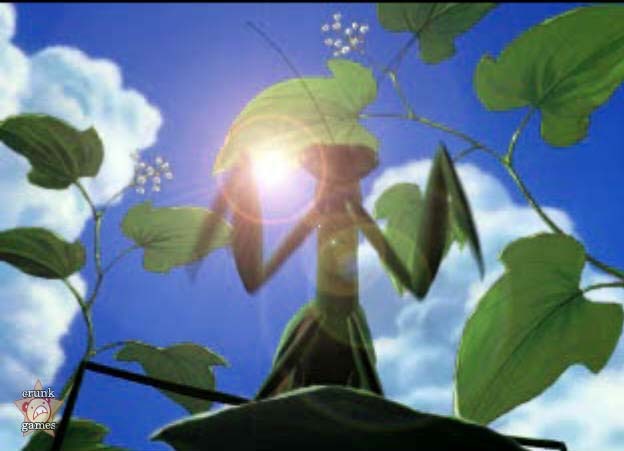 Each beetle has its own strengths and weaknesses, and the hope is that Boku can build up an impressive winning streak as he faces a gauntlet of his friends’ insects. As for style, Bokunatsu has that, too, all the way down to the disc art. The story of the game is actually told as adult Boku’s fond memories of that summer. 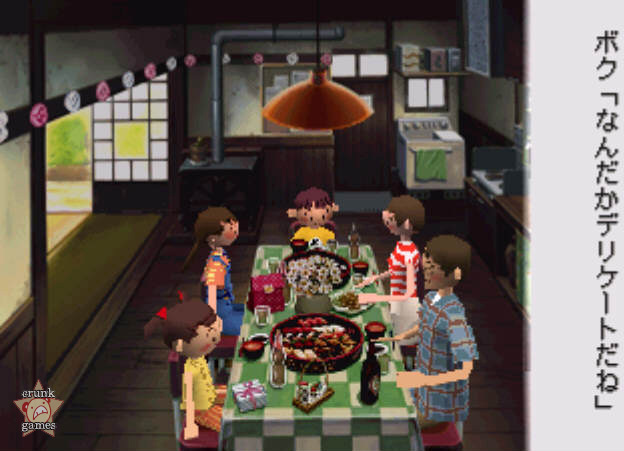 Often the game will switch over to the narrator, the present-day adult Boku. Performed by a voice actor known only as Duncan, his distinctive voice sounds like he belongs in some sort of nature film; all too fitting considering the environment. The backgrounds in the game are all bitmaps, but they’re not the usual set of substandard CGI renders you’d usually find. 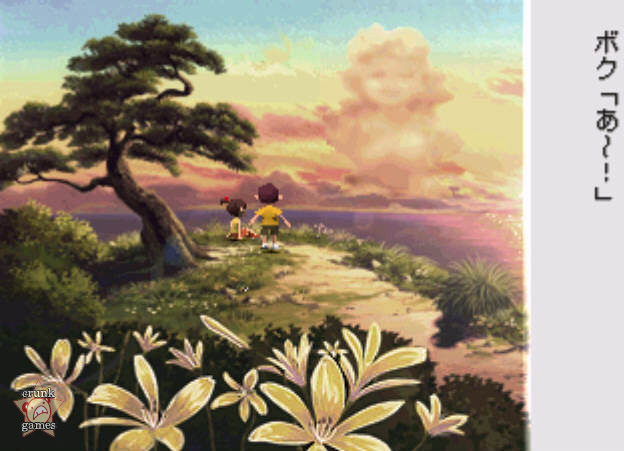 The developers contracted background artists KUSANAGI Corp., responsible for many anime and game backgrounds, including the PlayStation Final Fantasy games, to fashion a museum’s worth of beautiful nature paintings. The large piece of property that the family lives on is covered in all manner of flora and surrounded by tree-covered hills, and all of it is painstakingly depicted to the point where you can almost smell the fresh days and cool nights. The use of prerendered backgrounds may seem like a cheap way of doing things, but it soon becomes obvious that this was the best approach. Perhaps not only due to the PS one’s technological capability, but to strike a suitable contrast with the simplistic character designs. Well-known Japanese storybook creator and illustrator Mineko Ueda helped out in creating the characters for Bokunatsu, her simplistic but colorful and down-to-earth artwork perfectly lending to the game’s feel that it is almost like a book itself. As appealing as the visuals are, the soundtrack isn’t quite in the same league. But that isn’t to say it’s bad, because there isn’t much of a soundtrack, really. Boku’s day-to-day activities are accompanied mostly by the sounds of the forest creatures and of the nearby streams. Barely a handful of musical interludes pop up besides the opening themes, but that truly is it. Either it’s a form of artistic expression or some sort of copycat action of a prerendered game (Resident Evil has well-done music, but isn’t really known for it), but whatever the reason, the lack of music works. As far as actually playing the game, we bet you can guess how it controls already just by reading the last few paragraphs. And you’d be right: it’s like playing an all-ages Resident Evil, except with a much-needed quickturn. Progress-wise, since Boku is spending a whole month on this vacation, the time needs to be broken up somehow. Enter the in-game clock, which moves forward whenever Boku goes into another screen. Once the sun starts going down, he needs to hurry back to the house before his uncle catches him. Likewise, if he stays up too long, he misses the morning exercise and thusly doesn’t get his exercise card stamped. A shame indeed. On August 31st, Boku’s vacation — and thus the game — ends. If the player stays on track, then the past four and a half weeks illustrate an adventure of meeting relatives, making new friends, wrestling beetles, finding ghosts, discovering the beauty of nature, and perhaps most enamoring, receiveing the news of a new baby sibling. But it’s time to say goodbye, and sure, everyone is a little sad, but we already know that Boku never did forget that very special summer vacation. 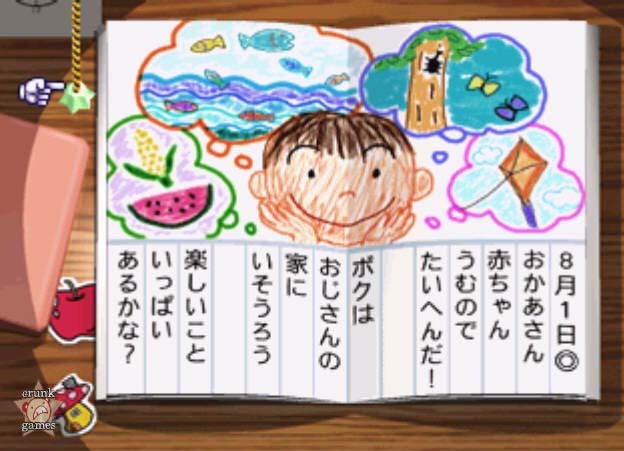 Depending on how many special events Boku encountered during his stay, players can view a selection of different endings that tell how his adult life ended up. They range from the sobering (stuck in a boring office job) to the satisfying (a longstanding affinity for nature) and add a dynamic element that really adds to the charm of the game. The song heard in Boku no Natsuyasumi’s intro is a modern remake of a popular Japanese folk song from the ’60s, Ryoko Moriyama’s Kono Hiroi Nohara Ippai. The game’s slightly more rocking version was sung by Fumi Oto and released as a CD single. While the original had a heartfelt sound, the newer version is appropriately summery.